Following three years of extensive research and development, Polymer client DNW Group launched the ‘Heuga’ housing model to the Australian market late last year. The brain-child of DNW Group CEO Dean Willemsen, Heuga is the first fully-automated housing system to be manufactured off-site in Australia, with homes progressing from concrete slab to structural lockup and external finishes in just 15 days. DNW Group joined with founding partners Impresa House, Masterwall and Elderton Homes to unveil the first Heuga prototype homes in November at Clearstate’s Alex Avenue project in Schofields, NSW. Polymer secured coverage across print and online media for the launch, including National Nine News, Real Estate Talk, The Urban Developer and The Fifth Estate. Don’t forget to follow Heuga on Instagram @heuga.au to keep up-to-date with all the latest Heuga developments. The Polymer team was excited to move into its new headquarters during February. The Commons is a ‘creative work and think space’ that encourages a flexible approach to work culture. Grounded in community, creativity and collaboration, the working model has proved such a success in Melbourne that it has now expanded interstate. Notably, the co-working space is carbon neutral and powered by 100 percent renewable energy, setting a new standard for social responsibility in the workplace. Based in a three-storey converted warehouse in Chippendale, The Commons Central has become a hive of activity since opening its doors last month. Complete with a photography studio, a podcast room and weekly yoga and meditation classes, we’re excited to be part of this exciting, forward-thinking work culture that seeks to redefine the meaning of a day at the office. Polymer client Clearstate is set to deliver over 1,700 much-needed homes to the Sydney, Melbourne and Brisbane markets, following the company’s first major capital raise since its inception in 2011. Kandis Investments Ltd, an affiliate entity of US-based, global investment firm, Avenue Capital Group, has entered into an agreement with Clearstate to provide funding to the value of AUD$50million. DNW Group’s Managing Director, Dean Willemsen, says the funding will help Clearstate embark on a new era of expansion. 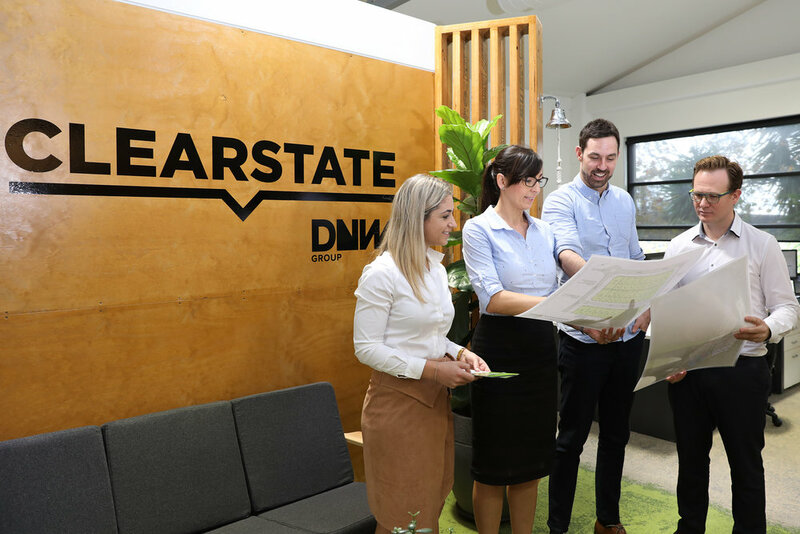 “We’re excited about what Clearstate can achieve over the next five years and we look forward to working with even more Australians to show them the benefits of being a Clearstate customer,” he said. On the back of this exciting news, Polymer secured national print and online media coverage for our client, including Australian Financial Review, RealEstate.com, and The Urban Developer. In early December, Polymer managed the ‘topping out’ ceremony at Greenland Australia’s masterplanned project in north-west Sydney, ‘nbh at Lachlan’s line’. 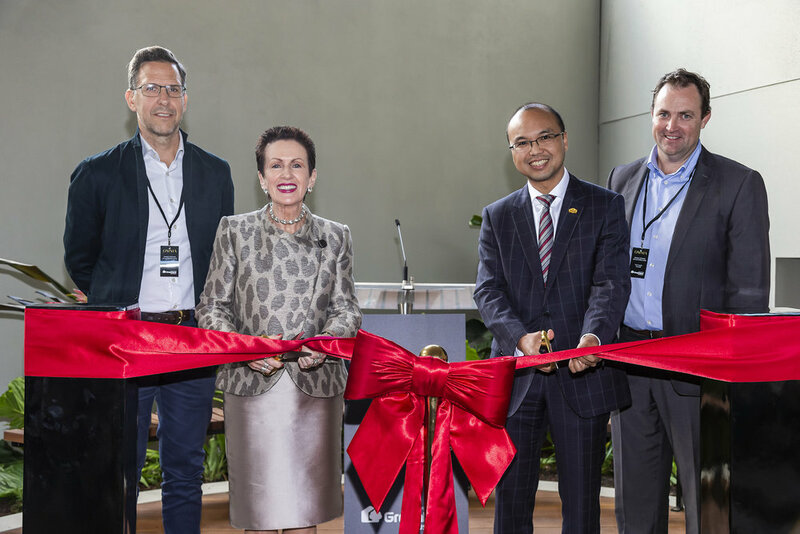 The important milestone was held on the rooftop of the 17-storey Nexus building, which boasts views to the Sydney CBD and over the neighbouring Lane Cove National Park. Greenland Australia representatives joined project builders Ganellen for the occasion, which celebrates the structural completion of the highest floor of the development. nbh will deliver nearly 592 dwellings and over 5,000sqm of retail floor space to the suburb of Macquarie Park, with Greenland Australia’s Managing Director, Sherwood Luo, speaking of the bright future ahead for the future community upon completion of the project in the second half of 2019. “Macquarie Park’s strong business community and central location means it is fast becoming one of Sydney’s most sought-after residential suburbs,” said Mr Luo. Polymer’s Strategy Director Andrew Coward has been appointed to the Design Futures Council (DFC), a DesignIntelligence gathering of development, architecture, design, engineering, construction, product and technology leaders. The group explores global trends, challenges, and opportunities to advance innovation and shape the future of architecture, engineering, construction (A/E/C) and design. The DFC Advisory Board works to ensure the relevance of architecture, engineering and construction, fostering a community of leaders committed to sharing their strategic foresight across these areas in light of global industry trends, innovations and challenges. The Design Futures Council has recently launched in the EU and in Australia following 25 successful years of history in the USA. The Australian operations are led by Alexia Lidas – the DFC can be followed on Instagram @dfc_aus. On Monday 26 November, The Right Honourable Lord Mayor of Sydney, Clover Moore, attended the official opening of Potts Point’s new landmark building, Omnia. The Lord Mayor and Greenland Australia’s Managing Director, Sherwood Luo, performed a ribbon-cutting ceremony to mark this important milestone for Greenland Australia. They were joined by major stakeholders, including construction partners Probuild, architects Durbach Block Jaggers, SJB, Studioaria and other project consultants. The $320 million, 20-storey Omnia apartment building features 132 residences, and is uniquely located between Victoria Street and Darlinghurst Road, with the development already gaining widespread attention for its curvaceous hourglass angles, atop a unique sculptured retail podium. As well as managing the event, Polymer secured extensive print and online media coverage for the grand opening ceremony. Polymer Project Coordinator Angus Tinworth has been training hard the last few months, preparing to run in an overnight, 84km charity ultra-marathon in Bali this May. Angus will be running coast-to-coast in a 7-day experience, targeting a minimum of $7,500 in fundraising for the event, of which 100% will go directly to multi-award-winning charity partner Bali Children Foundation. Joined by an international line-up of athletes, the goal of the event is to provide funds towards essential infrastructure and services to the Balinese community. You can read more about the Bali Hope Ultra Marathon here, or to support Angus’ run, click here. In conjunction with Country Garden Australia (CGA), Polymer recently coordinated a series of project completion tours for CGA’s $580M Bates Smart Architects-designed project in north-western Sydney, Ryde Garden. Polymer escorted representatives from key property industry bodies – including the Urban Development Institute of Australia’s NSW chapter, the Property Council of Australia (NSW) and the Urban Taskforce – on a walkthrough at Ryde Garden, which consists of 830 apartments across three towers ranging from 12 to 28-storeys in height. The tours revealed the extensive residential amenity across the 17,580sqm site, including a private 30-metre lap pool, gymnasium, childcare facility, street level retail and concierge, as well as Aspect Studios-designed rooftop gardens with BBQ’s and landscaped ground plane areas. Located within the North Ryde Station Urban Activation Zone, the completion tours also highlighted the project’s role as a prime example of a transport-oriented development (TOD), courtesy of its positioning at the doorstep of the North Ryde Metro station. Ryde Garden’s high-rise apartments will ultimately become home to around 2,500 residents, who will enjoy uninterrupted views to the city and the surrounding district. Polymer has just commenced its first project in Adelaide – Greaton’s highly-anticipated residential project, West Franklin, in the heart of the South Australian capital’s west end. Polymer assisted Greaton with media and public relations services for the Stage One settlement, with buyers moving into the first two residential towers of 17 and 19 storeys on Monday 25 February. Polymer secured coverage in Adelaide’s major newspaper, the Adelaide Advertiser, as well as news.com.au, realestate.com.au and a range of property industry trade publications. West Franklin is Adelaide’s largest CBD-based urban renewal project, with the Stage One completion also marking Greaton’s first project in South Australia. The $140M Brown Falconer-designed project revitalises the former site of the iconic Balfours Bakery, with 272 premium apartments constructed on the site. The surrounding vicinity is also set to benefit, with 1,245sqm of retail space providing a shopping destination for Adelaide’s west end, while a supermarket, café and boutique retail outlets are also proposed. The West Franklin site offers abundant resident amenity, including a 25-metre heated infinity lap pool, fully-equipped gymnasium, sauna, steam room, cinema, library and conference area. West Franklin residents will also enjoy an outdoor pergola-covered podium, with BBQ facilities, indoor kitchen and shared lounge, plus internal and alfresco entertaining spaces. 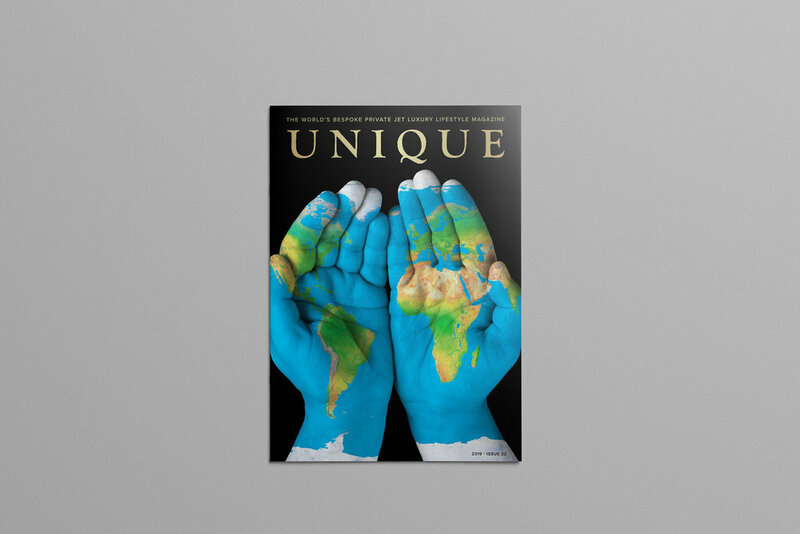 Polymer has broadened its international horizons, teaming up with exclusive private jet magazine Unique Aero to produce a series of special edition editorial spreads. 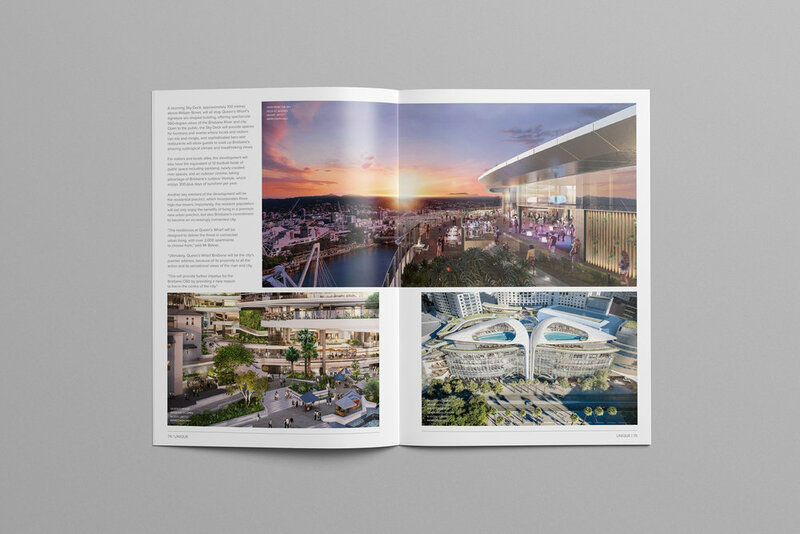 Among the articles produced for the luxury-lifestyle magazine, Polymer profiled the Star Entertainment Group and its major Brisbane project, Queen’s Wharf, which is set to be the largest urban renewal project in Australia. Commencing construction in 2017, Queen’s Wharf will transform nearly 20% of the Brisbane CBD into Australia’s most significant recreational, cultural and tourism precinct. When completed in 2022, the development will include four new hotels, including a premium six-star Ritz-Carlton hotel, totalling over 1,100 rooms. Polymer also had the privilege to profile World Class Global’s ‘Australia 108’ project, one of the highest residential towers in the southern hemisphere. Set for completion in 2020, the 100-storey, 319 metre-tower currently under construction in Melbourne, Victoria is shaping up as one of the most recognisable skyscrapers in Australia. The landmark project was designed by world-renowned Australian architecture practice Fender Katsalidis, who also designed the nearby Eureka Tower, Mona Museum in Hobart and the NewActon Precinct in Canberra. To find out more about Unique Aero, head to the website. Country Garden Australia launches their first Australian masterplanned community, Windermere, Mambourin. Polymer recently launched Country Garden Australia’s first masterplanned community in Australia. Located in Melbourne’s booming western region, Windermere is a 363-hectare site that will feature approximately 4,700 homes of varied housing types to be progressively delivered over an 8-10-year timeframe. Along with launching the project, Polymer has been engaged to develop and implement the communications strategy for Windermere. This has included hosting a media tour to site, running a construction commencement ceremony in October, producing weekly eDMs, establishing and developing a strong social media presence and securing media coverage for the upcoming village hub. Polymer also facilitated the collateral and communications strategy for Windermere’s ‘Family Fun Day’, which was a great success. Windermere promises to be an inclusive, family-oriented community, with a future choice of three government schools and one private school within the estate, 50 hectares of green space, a retail hub and a variety of sports facilities. Polymer is proud to be working with masterplanned projects that keep community at the centre of their focus, and Windermere is a prime example of this industry-wide shift in urban design. Happy 1st Birthday to Polymer Studios! What started as a solo leap of (measured) faith, has rapidly evolved into a team of eight highly motivated doers, innovative thinkers and industry shapers. Our successful year has been topped off by the opening of the Polymer Studios office in Melbourne. Our dynamic team of media and corporate communications specialists has flourished in Polymer’s fast-paced environment, and we are excited to be co-sharing our Melbourne office with NH Architecture in Flinders Lane. With 2019 right around the corner, we are looking forward to a new year of challenges and accomplishments with our current and future clients, consultants and suppliers. Our partnerships have seen us grow from strength to strength in developing sustainable and mutually beneficial relationships with industry affiliates and community groups alike, and the year to come is looking brighter than ever. Polymer recently assisted leading Australian developer TOGA launch their new Penrith project, Penway Place. Located on the corner of Union Place and Mulgoa Road, Penway Place will consist of four buildings, providing a new urban residential and mixed-use precinct that acts as a marker for the western gateway of the Penrith CBD. Market-leading built environment specialists SJB Architects, and their design partner Studio Prineas won the design competition for Penway Place, and Polymer was engaged to develop the communications strategy for its launch in April, which included traditional media relations, a first home buyers guide and resident case studies. The first release of 81 apartments will feature a mix of one, two and three-bedroom configurations, with a number enjoying views to the Nepean River and neighbouring Blue Mountains. TOGA is known for award-winning projects such as the Jones Bay Wharf rejuvenation and Bondi Boheme, and the company is expecting Penway Place to play a similarly transformational role in the future of Penrith. With plans to include a vibrant public plaza and retail precinct, Penway Place is set to provide a lively space for the local community, visitors and residents alike to enjoy. Polymer’s Head of Strategy Andrew Coward was invited to judge at the NSW Department of Education’s inaugural Game Changer Challenge. The Challenge saw over 100 primary and secondary schools from around NSW convene at the Department’s brand-new headquarters in Parramatta to present their idea for the school of the future. Australia’s unprecedented population growth means that as cities densify, new vertical, tech-enabled schools will be the way of the future. Indeed, Parramatta’s own Arthur Phillip High School will be one of the first high-density schools in Australia. The new school is currently under construction and is due for completion in late 2019. Along with Adobe, TrickyJigsaw and the Department of Education, Andrew judged eight ideas from the secondary school teams. It was an inspiring day and there were some fantastic presentations and innovative ideas presented to the judging panel. The lucky winner was the team from Carenne School, Bathurst. Polymer was thrilled to assist leading sustainability consultant Morphosis and global professional body RICS launch their ground-breaking research report into the sustainable digitalisation of real estate earlier this month. ‘Crossing the Threshold’ investigates the magnitude of the culminative mega-trends that are set to shape the future of our cities and real estate, including artificial intelligence (AI), augmented reality and autonomous vehicles, blockchain, the internet of things and robotics. A culmination of two years of research, ‘Crossing the Threshold’ offers guidelines pertaining to the responsible, ethical and sustainable integration of technology as it increasingly shapes every aspect of our lives. The report outlines the numerous benefits of digitalisation, while offering sustainable and ethical approaches to potential risks such as job automation, cyber security and electronic waste. The industry-wide effects of technological innovation and ‘smart city’ integration was demonstrated by the representatives for the City of Sydney, The Ethics Centre and Laing O’Rourke attending the breakfast, along with major property developers and owners, key industry stakeholders and built environment leaders. A lucky handful of Polymer team members attended Urbanity 2018, Australia’s leading conference for the property and urban development industry. 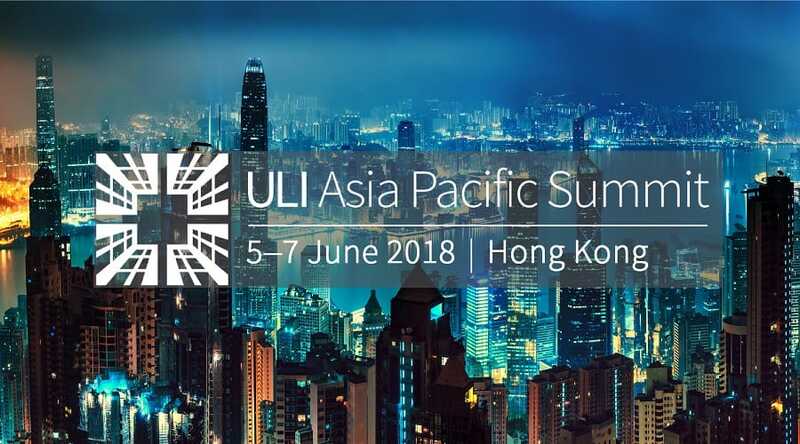 Held by our friends at The Urban Developer, an inspirational line-up of speakers, workshops, expert panels and site tours filled the three-day event, covering the latest ideas in urban design, smart cities and Urbanity’s theme for 2018: Urban Legacy. Stand-out talks included keynote speaker and Singapore-based American academic, Parag Khanna, who delivered one of the most-watched TEDx talks on cities and urban development. Parag spoke about high density urban clusters and the power that infrastructure lines hold over human behaviour and social organisation. Exploring connectivity as an ‘emerging megatrend’, Parag discussed the future of AI-integrated smart cities, with streamlined supply chains, considered urban clusters and optimised social spaces. Ex-journalist and foreign correspondent Michael Ware was stationed in war-torn Middle East for 10 years, witnessing first-hand the destruction of historical monuments and town centres through systematic attacks and targeted explosions. Michael’s understanding of urban legacy has been shaped by this experience, and he raised important questions on the ways in which cities can regroup and redevelop – both culturally and structurally – when faced with such violent, widespread loss. Polymer launched award-winning developer Cbus Property’s major mixed-use residential development, located in prime position north-west of the Sydney CBD and the iconic harbour. The Langston will supply the Epping community with one, two and three-bedroom apartments, along with a range of premium penthouse residences when the project reaches completion in 2021. Along with facilitating The Langston’s VIP launch night and media tours to site, Polymer has worked to identify and implement community engagement initiatives in Epping, hold business information sessions and develop a strong social media presence for The Langston project. Cbus Property is delivering significant public domain upgrades and much-needed public infrastructure to the rapidly growing north-western Sydney suburb. In addition to the 463 premium residential apartments on offer, The Langston will feature a retail precinct comprising 1,681sqm of retail and 1,921sqm of communal open space, all located just 100m from Epping Train Station. Polymer’s sister company Reactivate, and their client Cbus Property, will be celebrating the Epping community that is home to their major residential mixed-use development, The Langston. Over three days from Friday 30 November to Sunday 2 December, ‘The Langston Weekender’ will be jam-packed with live music, community market stalls, art performances, workshops and activities for the whole family to enjoy. Polymer has facilitated the communications for The Langston Weekender festival, which will feature a host of major food vendors including Knafeh, Koi Dessert Bar, Brickfields Bakery, Pepe Saya, Sparky’s Jerk BBQ and Tsuru. Complementing all those sweet and salty treats will be award winning brews from local suppliers Grasshopper Bar, Wayward Brewing Co. and The Welder’s Dog. The Langston will be delivering significant public domain upgrades and much-needed public infrastructure to the rapidly growing north-western Sydney suburb. In addition to the 463 premium residential apartments on offer, The Langston will feature a retail precinct comprising 1,681sqm of retail and 1,921sqm of communal open space, all located just 100m from Epping Train Station. Polymer has assisted the innovative minds at Texo with the development and implementation of a communications strategy for Naxan, an engineered wood alternative. Manufactured from three core natural materials – rice husk (60%), mineral oil (18%) and rock salt (22%), Naxan is set to revolutionise the Australian architectural, commercial property and home building industries. The sustainable product looks, handles and feels like wood, but is free from the environmental implications of traditional commercial timber-growing and logging. Its versatile applications include decking, cladding, architectural facades, hand railings, fencing, interiors and window framing. Naxan is Licenced by Texo Australasia and utilises cutting-edge Resysta® technology across detached housing construction, mid-high density residential, commercial, retail and industrial projects.